We worked closely with the community, staff, residents, and families of those living in the aged care facility on Norfolk Island to address their most pressing issue; the activity levels of the residents. This project added an additional multidisciplinary team meeting to the Older Persons Mental Health Team schedule each week and adjusted the meeting agenda, to allow more time for mental health care reviews. 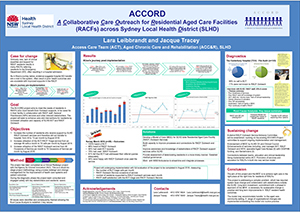 The ‘A Collaborative Care Outreach for Residential Aged Care Facilities in SLHD’ (ACCORD) project aims to deliver improvements in clinical leadership, education, processes and connections between the Access Care Team and Residential Aged Care Facility Outreach Service. Belmont District Hospital implemented an education package for nursing staff, to improve the use of the Confusion Assessment Method (CAM) screening tool in the emergency department (ED). The CAM tool is an affordable and easy way to dramatically improve the outcomes of patients presenting to the ED with delirium. Broken Hill Health Service in Far West Local Health District implemented the person-centred sunflower tool, to improve communication and build a rapport between staff, patients and carers. his project identified factors associated with an increased falls risk in older people with cataract during their wait for cataract surgery. Nyngan Health Service developed a falls workbook and DVD, which was used to educate aged care residents on falls and empower them to develop personalised strategies that would reduce their risk of falling. This project aims to reduce the number of unnecessary ambulance transfers of aged care residents, by developing a patient-centred care model. This model will determine the most appropriate care pathway, allow clinicians to deliver timely healthcare services and provide the patient with appropriate care in their home. Blacktown Hospital implemented a number of processes to track the use and improve the storage of walking belts and sticks in the Stroke and Aged Care Ward. This project developed a standardised capacity testing and guardianship application process for confused patients, with a multidisciplinary approach to support decision making in the hospital environment. A staff engagement and education process was developed by Bombala Multipurpose Service (MPS) and Delegate MPS, to improve admission documentation for high-risk patients. This project implemented a nurse practitioner led service that delivers care to older people in the community within residential aged care facilities or at home. The Southcare Outreach Service is a new model of care that delivers a rapid response, multidisciplinary team to clients aged over 65 years in their home to prevent presentations to the emergency department. This project provided a home-like environment for permanent aged care residents, with improved socialisation and mobility. It also involved residents in care planning and increased the use of Transitional Aged Care Program resources. 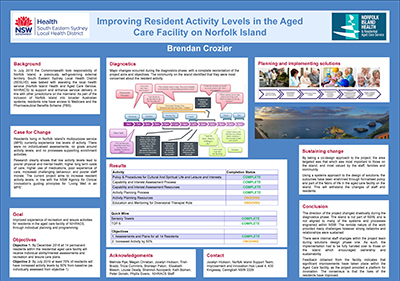 This project worked in collaboration with residential aged care facilities (RACFs) to assess current practices and develop a robust, sustainable and transferable process to deliver Advanced Care Planning in RACFs. Port Macquarie Base Hospital reviewed its fractured femur care pathway, based on the ACI's Minimum Standards for the Management of Hip Fractures. This resulted in a formalised orthogeriatric model of care that addressed factors including multimodal pain control, time to theatre, time to mobilisation and refracture prevention. This project created a new model of care to educate staff on how to manage the symptoms of urinary tract infections (UTIs) with alternative therapies, rather than multiple antibiotics. This project trained residential aged care facility and emergency department staff in the Identify, Situation, Background, Assessment and Recommendation (ISBAR) clinical handover tool to enhance the effectiveness of the Aged Care Emergency (ACE) service. A group rehabilitation class was established for eligible clients in weeks 6-12 of the Blacktown Transitional Aged Care Program, incorporating education, physical activity and social activities. The After Hours Program developed emergency guidelines and online training modules for the most common aged care presentations to emergency departments, including chest pain, stroke, abdominal pain, confusion and tubes. The online training program was created to train residential aged care facility staff in the implementation of these guidelines. CommunicatingCARE is an aged care education package incorporating Identify, Situation, Background, Assessment and Recommendation (ISBAR) methodology and 'Stop and Watch' early warning tools. The package was developed in consultation with local aged care providers, to help staff identify when a resident’s condition changes and allow them to communicate these changes to other health professionals. This project aims to enhance multidisciplinary teamwork in a rural hospital, by ensuring that acute ward and community health staff participate in care planning for admitted patients and improve the interface between the acute settings and community health services. This project was a result of the Junior Medical Officer Quality and Safety Committee. While defining its role in its pilot 12 months, concerns regarding the prescribing of benzodiazepines in the elderly inpatients were identified and acted upon by way of two audits, guideline creation and education packages. Under the GRACE model hospital staff work in collaboration with general practitioners and aged care facilities to avoid hospital admissions and reduce access block and length of stay for older patients at Hornsby Ku-ring-gai hospital. ACE is a shared care model between physicians, geriatricians and their teams. It integrates comprehensive geriatric assessment into the optimal medical and nursing care of patients in a multidisciplinary environment. This is a multidisciplinary team-based model, designed for patients over 50 years of age, presenting to the Emergency Department with a minimal trauma fracture. This project aims to provide care to patients in their home for patients who are living in Residential Aged Care Facilities. This will be through either face to face consultations or consultations using Telehealth (video conferencing). This project will also smooth the process for those patients who do need to go to hospital, avoiding lengthy stays in busy Emergency Departments. The Department of Health and Human Services in Tasmania has launched a revised version of their popular nutrition guide designed to boost the health of older Tasmanians. The Appetite for Life manual also contains sections on Nutrition Issues, Nutrition Screening and Resources. Aim: To improve the experiences of consumers in NSW Health services through Music & Memory. Aim: To develop a toolkit of resources facilitating Fascia Ilaica Block (FIB) as a method of pain management in hip fracture. Aim: To inform the development of a comprehensive model of care for equitable palliative and end-of-life care service provision in NSW. Aim: To improve the outcomes of patients with fractured hips requiring surgery and management in NSW. Benefits: Reduced medical complications, reduced hospital stays and improved patient outcomes.